I like to imagine the figures in this little watercolor of Gravesend Bay are father and son, wading on the rocky shore, watching the small moored ships and seagulls wheeling by while the scrubby hook of Coney Island dips into the sea at Norton’s Point. My father had no real interest in history, but to humor me he’d drive us around the neighborhood exploring. 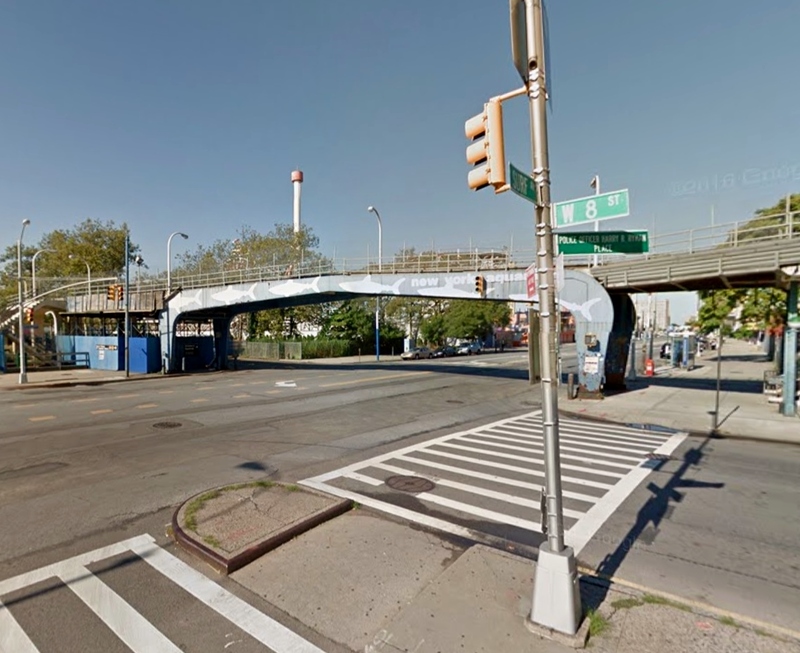 We “found” Coney Island Creek this way. I never tired of gazing across it with him. 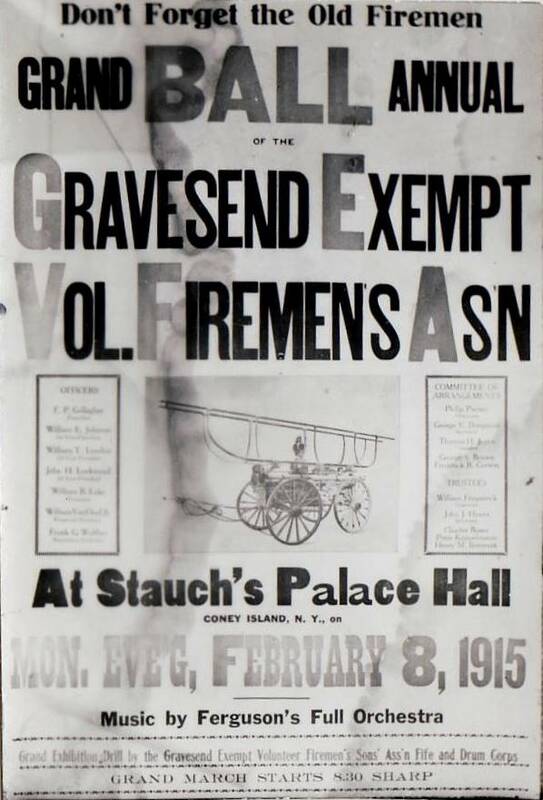 Continuing the challenge posed by my fellow members of the Society for One-Place Studies that we blog about 52 residents of our respective places in as many weeks, I turn my attention this time to the Gravesend Exempt Volunteer Firemen’s Association (G.E.V.F.A.). This is not so much a profile, as an endless list of names of those who attended the association’s annual ball in 1915. Incidentally, old-time firemen carried megaphones, or speaking trumpets called “vamping horns,” through which orders were shouted above the din of a blaze. 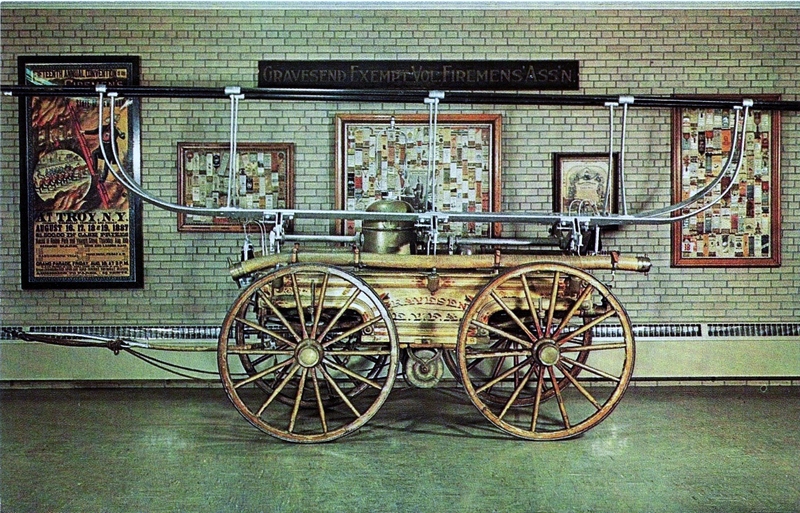 Hence the firemen, by extension, were nicknamed “vamps.” Read how the Gravesend Vamps kicked up their heels . . . .
Old Gravesend Hand Engine in Place of Honor at Coney Island Reception. Sons of Veterans Give Drill on Dance Floor. 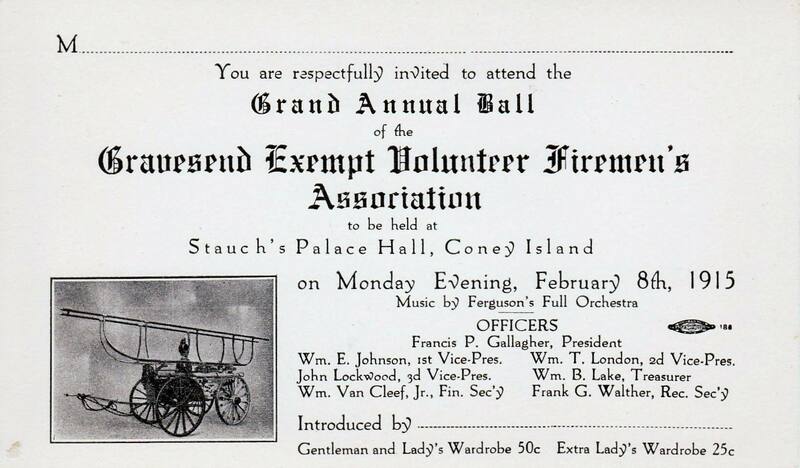 All roads led to Coney Island last night, when the invitation ball of the Gravesend Exempt Volunteer Firemen’s Association was held at Stauch’s Pavilion. 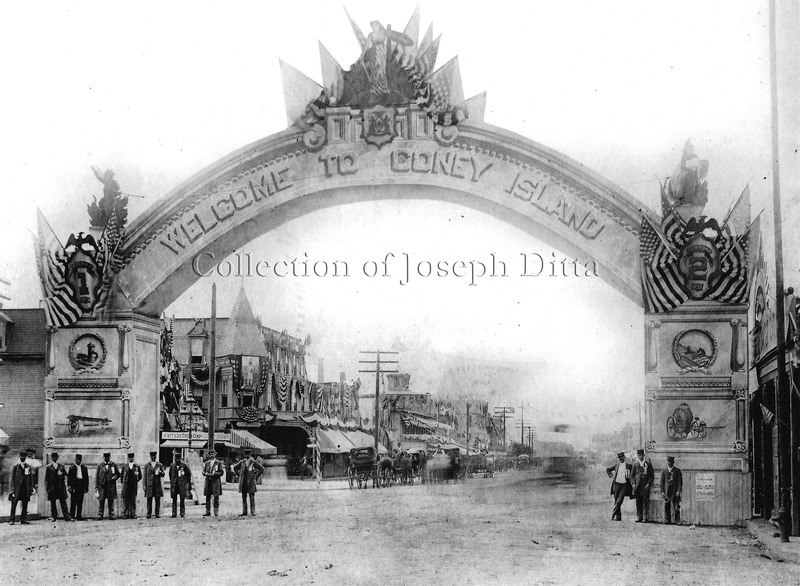 Many hundreds of residents of Coney Island, Sheepshead Bay[,] Bath Beach and the adjoining sections attended and helped make merry with the old “vets” who fought fires in the days prior to consolidation. As usual, the members appeared in their uniforms, with red shirts, and the old hand engine, which remains in solitary confinement during the year in the barn of “Father Bill” Lake in Gravesend, was brought upon the scene and occupied a prominent place at the entrance to the hall. The interior of the hall had been tastefully decorated, and with the lighting effect presented a pleasing picture. The committees in charge of the affair had prepared an exceptionally good order of dance, including the fox trot, tango and all the latest steps, which were thoroughly enjoyed by all present. During the evening several selections and a drill were given by members of the Gravesend Exempt Volunteer Firemen’s Sons’ Fife and Drum Corps. Three Hundred Couples in Line. 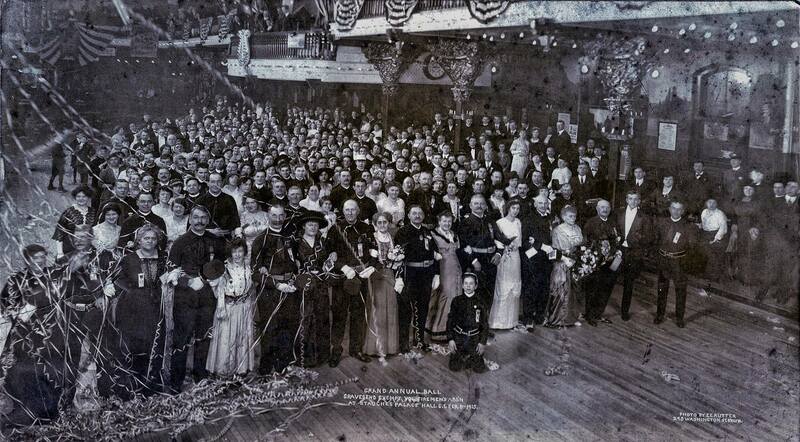 At midnight the grand march was led by Mr. and Mrs. Francis P. Gallagher, Mr. and Mrs. William Johnson, Mr. and Mrs. William T. London, Mr. and Mrs. Lockwood, Mr. and Mrs. William B. Lake, Mr. and Mrs. William Van Cleef, Mr. and Mrs. Frank G. Walther and followed by some three hundred couples. Dr. Alfred Chambers was floor manager, assisted by Charles M. Brewster, Patrick Gillen and Herman Wacke. On the floor committee were: James Jameson, Jr., chairman; Andrew W. Ahearn, George J. Ahearn, Charles Allen, William A. Aldrich, Arion [sic] M. Aumack, George A. Aumack, Berend W. Baas, Adrian Bogart, Simon Bogart, John J. Bowen, Andrew Boyle, Charles Brewster, James Brewster, George S. Brown, Jacob Buhler, Albert D. Buschman, John Byrnes, Dennis J. Costigan, Jr.; Hiram [sic] N. Cropsey, Anton Deferee, George C. Dangman, Patrick Dempsey, Charles L. Feltman, George H. Fredericks, Louis Frederick, Stanley French, Augustus Friend, George Gilmore, J.N. Goodfellow, Ernest Goskay [sic], Joel Halstead, Charles Hardwick, Richard Hayman, Frank J. Herman, Norton Inge, James Jameson, Sr.; Andrew S. Jameson, John H. Joyce, Ward B. Jones, Charles M. Kies, John Knuth, Jr.; Theodore Knuth, John Kopf, Johannes Kouwenhoven, George Kuckler [sic]; Abraham Lane, John H. Lockwood, Leo Loesing, Edward Maybert [sic], Benjamin McGray, Frederick A. Miller, Richard B. Moore, Thomas P. Murphy, Thomas Murray, George C. McBride, Bartlett McGettrick, John S. McGettrick, George Neusser, John Oliver, Peter J. O’Connor, William H. O’Connor, Paul Petrucelly, Andrew Poole, John Lundy, John W. Murphy, John B. Potter, Henry Schiffman, Gottlieb Seyfried, Charles Simmon, Louis Stauch, William H. Stewart, James Tanzey, George C. Tappen, Theodore E. Tripp, John Vandernoot, George Vanderveer, Charles F. Vanderwater, Strycker [Derrick Stryker] Van Sicklen, Fred von Fricken, Edward T. Walsh, John Whalen, George W. White. Richard Garms was chairman of the reception committee. On the committee were: Jeremiah H. Aheran, Frederick Below, Charles E. Boyd, Frederick Burkhardt, Charles Buschman, Alfred Chambers, James Connor, Cornelius Colwell, Frederick R. Corsen [sic], John M. Cun[liffe?] Jr., James Dooley, Frank Dunig[??? ], John W. Durand, Andrew J. Darb[??? ], Michael H. Daly, William V. [Eberhart? ], Harry J. Ettricken, Charles E. Fowler, James Gallagher, Thomas J. Gavin, Peter Gillen, Patrick Gillen, Alfred Girardot, Louis Gottlieb, John S. Griffin, George A. Hann [Hahn? ], Frederick B. Henderson, Peter Hourigan, Anton Huebner, John M. Jones, Henry E. Jones, Murray Kahn, Charles Kies, Jr., Hans Kronika, Frank Knuth, Henry Koch, Fred Lundy, William Muller, Morton Morris, William H. Miller, David Martin, Charles E. Morris, John J. McGettrick, Patrick McDonald, John W. McKay, William McKeon, Duncan D. McKinlay, Elwin Pl. Page, Louis Potter, Michael T. Reily [sic? ], Uriagh [sic] J. Ryder, Ambrose P. Rickerman, George Schwieckert, John Shaw, John B. Steininger, Harry Van Wart, John G. VanDuyn, Thomas Van Riper, Charles S. Voorhees, Herman Wacke, John T. Walsh, George Webb, Robert Whiteford, Nelson Williams, George T. Wood, Joseph Wright, Frederick Wyckoff, James F. Yarrington, William A. 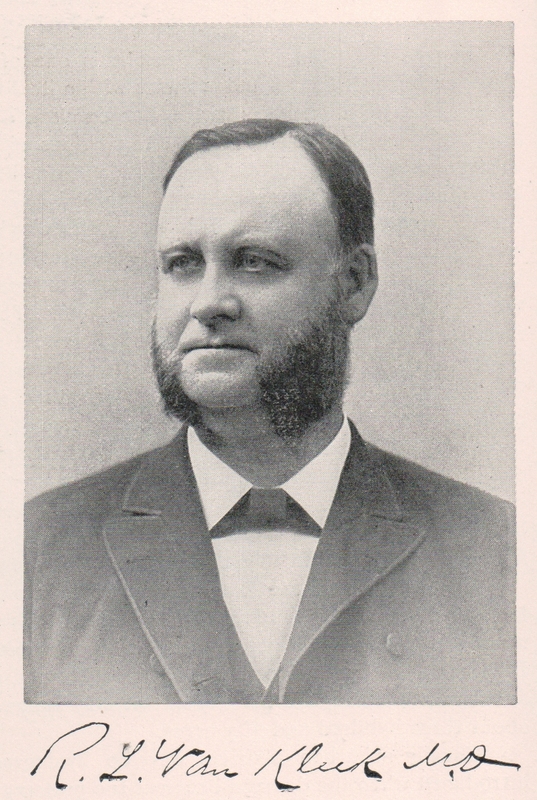 Young, Henry C. Young. The stokers are: William Kister, chairman; William Bishop, Christ Butterbrod, Joseph Byrne, George Campbell, W.T. Campbell, James Carr, Thomas Chatterton, George Clark, Frederick Cronin, H. M. Cummings, Frank G. Curnow, John M. Driscoll, Louis Duncan, William G. Ferris, Thomas Gallagher, Richard Geary, Edward Gray, Ernest Grotzinger, Frederick M. Hall, Louist T. Hauck, Gustav A. Hedler, Gustav A. Hedler, Jr., Charles A. Hollock, Louis Howard, John H. Jackson, Ike Jacobs, John F. Jameson, Christian Jensen, Phil Jolly, Chris Kavakos, John Kavakos, James Kennedy, Adam Klein, Stephen Knapp, William F. Kearns, Walter Larsen, Jim S. Lee, Burt G. Lewis, John Luhrs, John Lundy, Jr., Martin Lynch, John Madden, Charles Martin, Dennis J. McCarthy, George Menakakes, William F. Messiter, Charles Miller, Walter E. Morson, John M. Mulrean, Patrick McDonough, Peter McElroy, Barney McGuire, Ira McKane, Philip I. Nash, A. Nebenthal, Morton Newman, John Nichols, Frank C. Nostrand, Gus Oberland, John Oberlie, Stephn O’Brien, J. J. O’Connell, Goerge Pfaff, John Woodlin, porter; William Proudman, Martin J. Rauscher, James T. Reily [sic? ], Lester A. Roberts, James H. Robinson, Julian Robinson, Louis Rogers, William C. Rogers, Robert Rehm, Charles Rosenberg, Oscar Rubein, Samuel Samuels, John Savarese, Gus Schindlbeck, Frank Schulze, Philip Schweickert, Jr., Thomas A. Sharkey, John Sheridan, Jessie Sherwood, William Slavin, Edward Slavin, Edward Smith, Martin E. Smith, Thomas Spellman, Arthur J. Stern, Abraham Stiefel, Edward Strattan, Thomas Sutphen, Chris Talbot, Harry Temple, William F. Ulrict [sic? ], John A. Vance, Edward Vermilyea, Charles Victory, Gus Von Thaden, Samuel B. Weisberger, Joseph White, Joseph Whiteley, Albert Whitworth, Charles Wolford, James Woods and Adam Yockel. The officers of the organization are: Francis P. Gallagher, president; William E. Johnson, first vice-president; William T. London, second vice-president; John H. Lockwood, third vice-president; William B. Lake, treasurer; William Van Cleef, financial secretary; Frank G. Walther, recording secretary. Trustees–William Fitzpatrick, chairman; John J. Hynes, secretary; Henry Bateman, Peter Kappelmann, Charles Buser. Dr. R. L. VAN KLEEK, the present medical officer to the Gravesend board of health, has held that position ever since that body was organized in 1880. Dr. Van Kleek was born at Berne, Albany County, N.Y., on March 21, 1839, but when he was four years old his father and mother removed to Flatbush. There he became a pupil in the famous Erasmus Hall Academy. In September, 1855, he entered the New York University and was graduated in June, 1858; he was made Master of Arts in 1861. He began his medical studies at the New York University in 1859, and was graduated in 1862. The following twelve months he spent on the staff of the Kings County Hospital. Dr. Van Kleek left the hospital in August, 1863, and settled at Gravesend, where he began private practice as a physician and surgeon. From 1869 until 1889 Dr. Van Kleek was postmaster of Gravesend, and from 1889 until the present time has been physician to the Health Home at Coney Island.